One thing we feel strongly about here at BlockCAT is making crypto more accessible to everyone. In its current state, doing anything on the ethereum blockchain is pretty much an inherently technical process that requires using multiple sites/services, browser extensions and encryption methods. Our goal is to simplify this process as much as we can and deliver tools that are functional, valuable and easy to use — no matter your skill level. 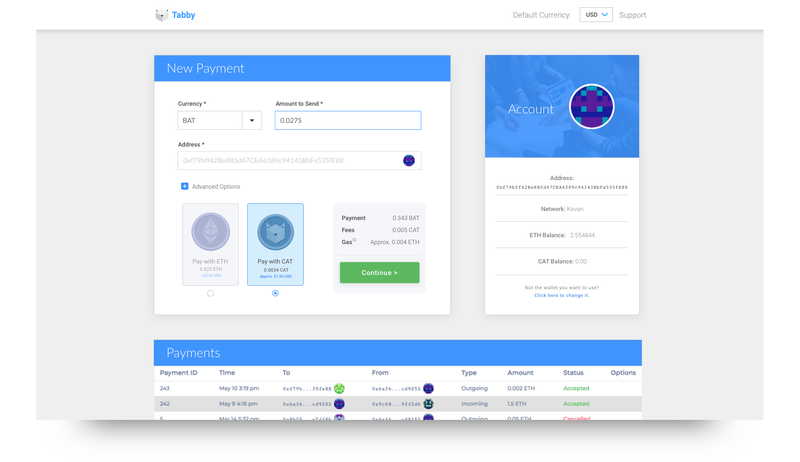 In the very near future, we’re going to be rolling out an additional feature in Tabby Pay that will allow you to send any ERC20 token safely and securely, using the same Tabby Pay smart contract infrastructure. This is a huge addition that opens up a number of potential collaboration opportunities to integrate with other services, wallets and exchanges. 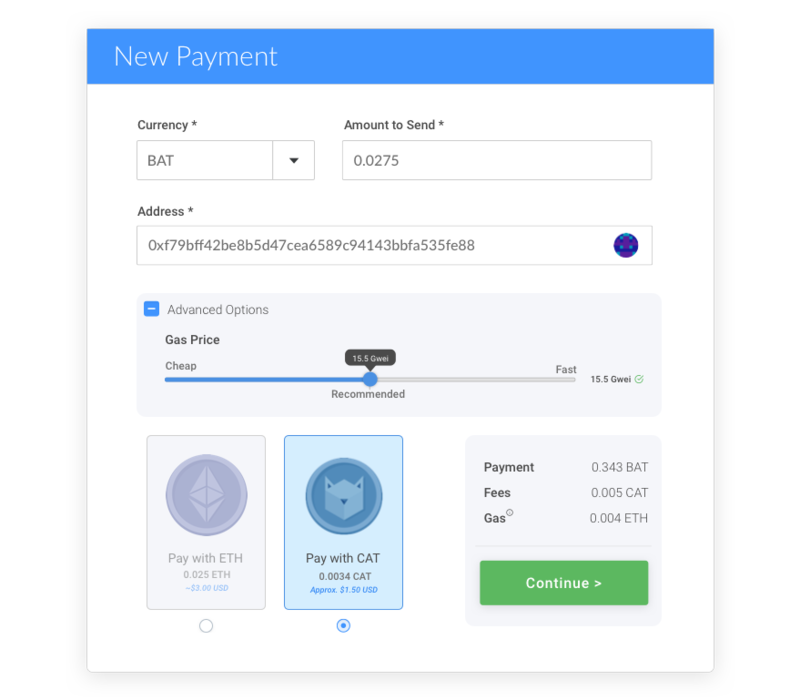 New to BlockCAT? Tabby Pay is a smart contract that’s built to prevent user error. If you send Ether to the wrong wallet, you can cancel the payment and your Ether will be returned. Learn more here. In order for us to provide the optimal user experience, we need to make our tools not only functional, but beautiful and easy to use. Our goal is to provide a better user experience than any other payment/smart contract application on the market. Based on what we’ve seen, gas is often not understood or utilized correctly. Most people simply just want their transactions to work. To simplify the process, we will not display any gas selection details by default— they’ll still be accessible for advanced users, but we by default make the right choice for most users: select a gas price which will get their transaction confirmed in a reasonable amount of time, without overpaying. Users can still open the gas menu and use the slider as usual, but now the slider represents Cheap and Fast — a better indication of how this works. A small tweak, but we’re making a simple process even easier by default (while still giving advanced users the ability to tweak this). 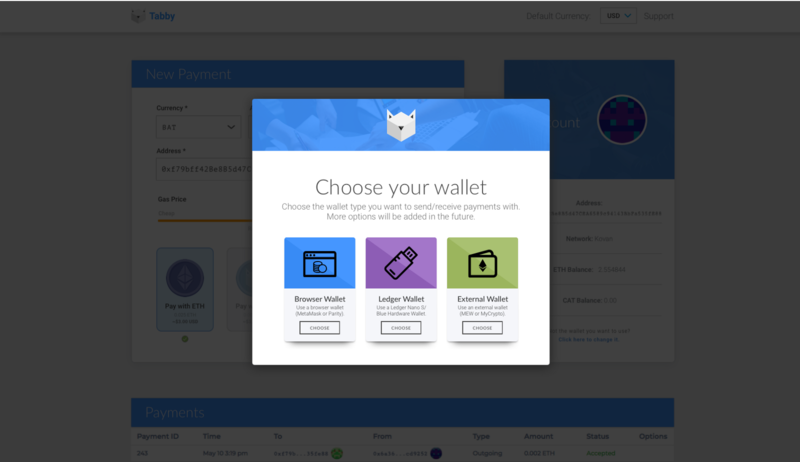 We’re also cleaning up and unifying our wallet selection to be reusable across all of our products/smart contracts.